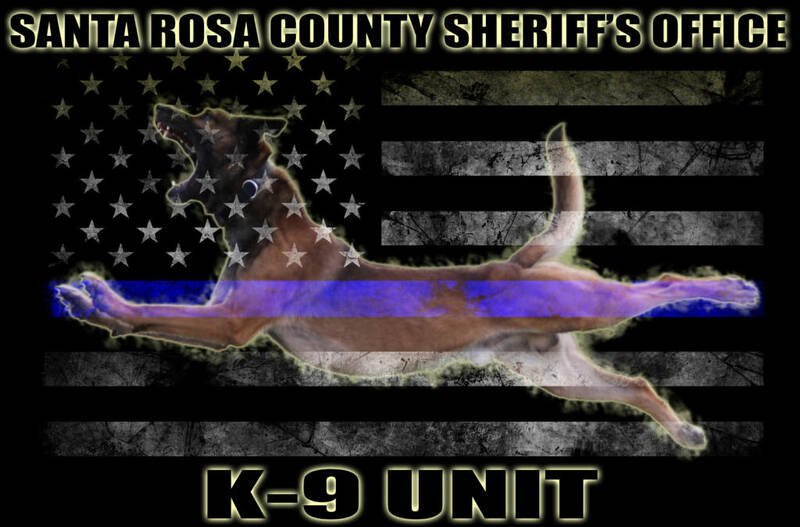 The Santa Rosa County Sheriff’s Office consists of a Captain OIC, a supervisory Sgt, and six K9 Handler/Dog teams. Our dogs consist of Belgian Malinois, German Shepherds, and one Yellow Labrador. Six of our K-9’s are dual-purpose dogs that are trained to locate narcotics such as Marijuana, Cocaine, Heroin, and Methamphetamine, as well as search for and apprehend high-risk criminals who have fled from law enforcement and/or concealed themselves to avoid capture. We use Belgian Malinois and German Shepherds for this type of work. These dogs have been through extensive training courses. Once this initial 480 hours of training and certification has been completed, the K-9 Team continues to train with these dogs almost daily to enable these valuable tools to keep their skills up. We have one single purpose dog, a Yellow Labrador, that is trained in narcotic detection. This dog has also been through an extensive training course. Why do we need dogs in police work? Simply put, they can do things that their human partners can’t. By use of their keen senses, they are able to sense what people cannot. Due to their keen sense of smell, sight, agility and other abilities, they are a very valuable tool in police work. Dogs can be trained to find people, both those that are hiding from various law enforcement agencies to avoid being taken into custody, as well as those individuals that have become lost or are missing. Dogs can also be trained to detect various narcotics and explosives. By training with actual narcotics and chemicals used in explosives, the dogs are able to smell the very distinct odors given off from these items. Most of our dogs are also trained in “handler protection.” Unfortunately, many times a K-9 Deputy, or “handler,” will be called on to help apprehend a violent person. These dogs are trained to find and apprehend the individual that has presented themselves as a threat to our community. They are also trained to help defend officers that are attacked by a violent person.